Hello there! I’m back and wow, what a summer! It’s been a couple of months since my last blog where I wrote about going dairy free. I contacted Natasha to ask how she was finding the change in her diet and she told me she was feeling good and found she had much more energy. She told me her daughter Autumn, was 100% better and now her normal, happy self. They will have to try to reintroduce milk into Autumn’s diet next year but Natasha said she will think differently about consuming diary products after this period of going dairy free. If you’re wondering where I’ve been for the last couple of months I can tell you that I’ve been quite busy. Our first trip away was in Ibiza where I was introduced to a lovely little café called Passion. It’s near Marina Ibiza (www.passion-ibiza.com). It’s a cute café with a laid back and welcoming feel. Passion’s menu is full of delicious healthy food so I bought a few items to sample, looking for inspiration. Their Raw Pecan Pie was heavenly and I really enjoyed the Acai Bowl which came with chopped bananas, peanut butter and cacao nibs. I was lucky enough to visit Peyotito which featured as a pop up restaurant at the new Nobu Hotel in the bay of Talanamca, just a couple of kilometres away from Ibiza Town. Peyotito serves high-end, modern Mexican food in a trendy, informal setting. Executive Chef Alex Stumpf is a friend of my colleague and the main reason we went to this restaurant. We were welcomed with a passion fruit Margarita and ate guacamole with salsa, deep fried calamari, beef and lamb tacos and a raw tuna dish which was to die for. I don’t really like tuna as a rule but this dish was exceptional. The food there was amazing and I highly recommend a visit if you are in Dubai or London (www.peyoterestaurant.com). 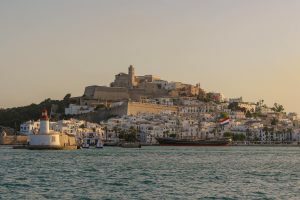 From Ibiza we travelled east, through the Balearic Sea to southern Italy and then onwards through the Tyrrhenian and Ionian Seas towards the Corinth Canal. The Corinth Canal connects the Gulf of Corinth with the Saronic Gulf in the Aegean Sea. We travel through it each year. It is very peaceful there, all you can hear is the gentle hum of our engines and dozens of crickets chirping above. Each year approximately 11,000 ships pass through the clear blue waters of the canal measuring 6.4km long and 21.4km wide. On our approach to Athens all we could talk about was how good the gyros would taste when we arrived. Gyros is a Greek kebab, normally served in a pitta bread with salad, fries and tzatziki. They are so delicious and you can generally pick one up for 2-3euro in Athens. We always go to Lamarina, Souvlaki & More (Facebook page: @lamarinafood) in Marina Zeas as we think they do the best ones in that area. Many discussions were had over whether pork gyros or chicken gyros were the best and how you can’t leave the chips out of it otherwise it just wont taste the same. We arrived in Athens after five days at sea and we were not disappointed. 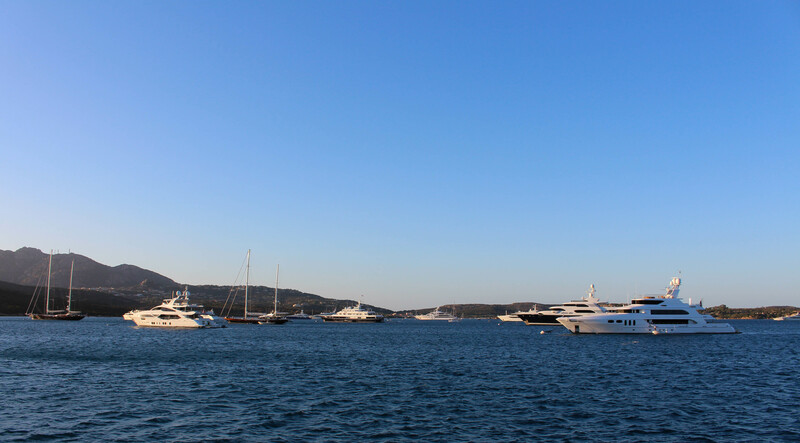 Our next port of call was Mykonos, the place I get most excited about going back to each year. It’s a pretty town made up of narrow white streets littered with boutiques and restaurants. A restaurant I always like to go to when I’m in Mykonos is Katerina’s (www.katerinaslittlevenicemykonos.com). It’s in Little Venice, on the water and over looks the famous windmills of Mykonos Old Town. Katerina’s terrace is a small balcony which hangs over sea, making it a perfect place to sit back, relax and enjoy a glass of wine as the waves crash beneath you. 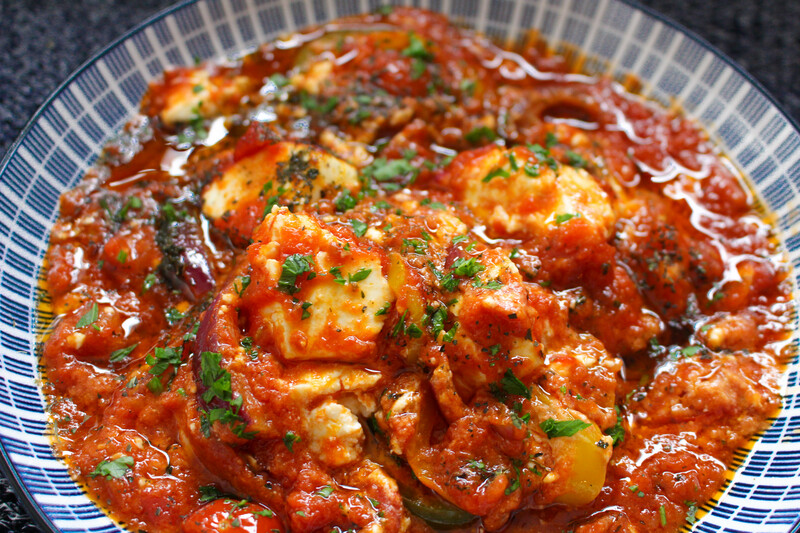 On my last visit I had a couple of glasses of local red wine and a dish of feta baked in tomato sauce. The dish comes with some pitta bread topped with oregano to help mop up all of the delicious flavours. 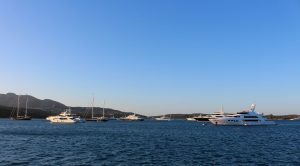 From Mykonos we headed to Sardinia, spending an evening in the luxury resort of Porto Cervo and then to the famous Cala di Volpe Bay. Cala di Volpe is a long bay in north-eastern Sardinia on the Emerald Coast. I’m always fascinated at how beautiful the sea is in this part of the world. We loved to feed stale bread to the fish after breakfast or lunch service. We called it our “fish therapy” because we felt mesmerised watching the hundreds of blue fish swimming after the bread. My favourite Sardinian dish would have to be Gnocchetti Sardi. 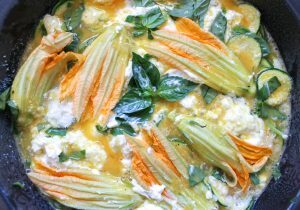 I worked with Sardinian chef, Giovanna Uras (Instagram: chef_gio_onboard) a few years ago and she would cook this dish for her guests. Giovanna told me that whenever there was a wedding in her local town her mother would make hundreds of these tiny pasta by hand. 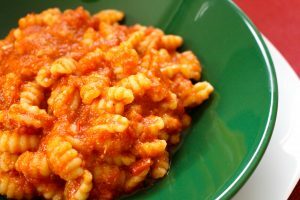 This pasta is also known as Malloreddus (small caves) and is made with semolina instead of flour, giving it more bite than regular pasta. The pasta does not contain eggs and saffron is often used to give the pasta its famous yellow colour. 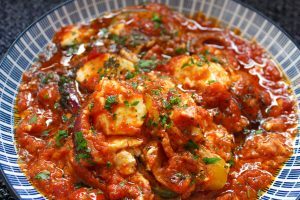 It is traditionally served with a tomato sauce or ragu and some pecorino cheese. Before the end of our trip we sailed to Capri and the Amalfi Coast. There’s a small shop in the harbour in Capri called Salumeria Da Aldo. It’s always busy and the family who own the shop and their employees are so friendly. I am always greeted with a warm smile and it’s lovely that they recognise me each year I go back. Aldo’s wife marinates sliced tomatoes in olive oil, basil and some seasoning while her husband slices thin cuts of salumi and tears up the freshest mozzarella to make sandwiches for their customers. While in Amalfi one of our guests offered to prepare a salad for their host called Panzanella. 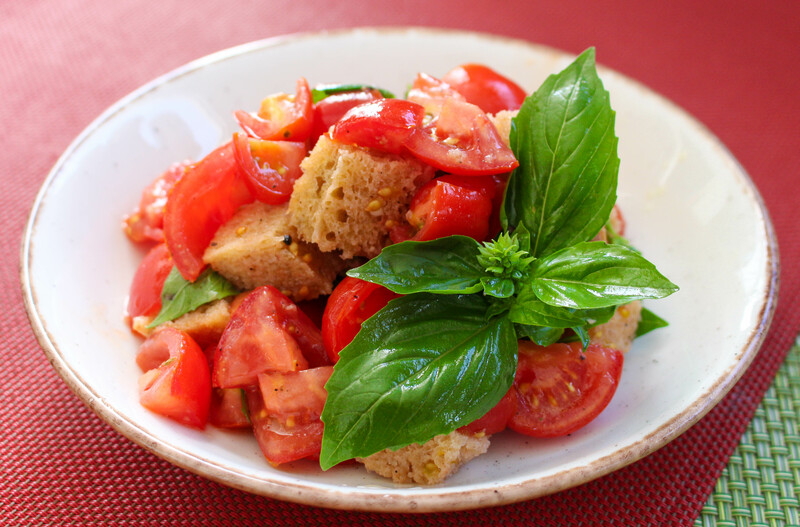 Panzanella is a wonderful Italian dish made with stale bread and fresh tomatoes. Tomatoes are macerated in garlic, basil, salt, pepper, oil and vinegar. It is a very economical dish and it amazes me how some stale bread with the help of a few very simple ingredients can be transformed into something so delicious. We’re back in our berth now on the Côte D’Azur in France. I’ve had a great summer and we’ve been lucky to see some beautiful places but as Frank Sinatra once sang “It’s very nice to go trav’ling, but it’s oh so nice to come home”. I’m looking forward to spending more time with my camera and writing some more recipes for the website. If you would like a recipe for anything, please feel free to ask. I’m always looking for a new challenge.